★0.6m/2ft USB 3.0 riser cable enabling flexibility in the placement of your PCI-E devices. ★3 High Quality Solid Capacitors and one stabilivolt on each card for reliable and safe power delivery. ★Overcurrent Protection (Surface Mounted Fuse) to safeguard your components in the event of a short circuit. 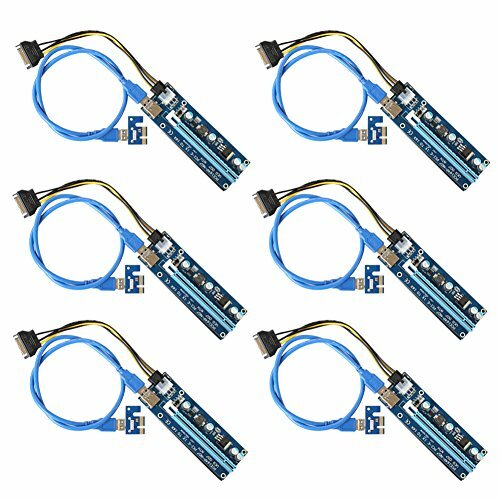 ★6-Pin MOLEX to 15-pin SATA power cable for direct connection to your power supply reduces the power burden on your motherboard and ensures maximum compatibility with your power supply. ★The perfect solution for setting up Ethereum mining rigs, whether small open air rigs or large rack based miners. ★Gold plated contacts for flawless connectivity and a long lifespan. ★1x adapter PCI-E card can be inserted in any PCI-E Slot: 1x, 4x, 8x, or 16x. ★No drivers needed to install. ★4 Holes For attaching the riser card to your rig. Upgrade Version: Version 007 PCIe riser kit are the best solution for setting up Ethereum/Bitcoin/Litecoin and other GPU-mined altcoin mining rigs. Stability: 4 high quality solid capacitors and one stabilivolt make the power delivery more safe and more stable. Perfect Length: 0.6m USB 3.0 extension cable enabling more flexibility in the placement of your PCI-E devices. Long Lifespan: Adopting gold plated contactors to ensure durability and flawless connectivity. If you have any questions about this product by VOLADOR, contact us by completing and submitting the form below. If you are looking for a specif part number, please include it with your message.